Our Casting, Forming and Welding I Tests allow you to experience an online examination in the real-time environment. In every online test on Casting, Forming and Welding I, you will be presented with Multiple Choice Questions (MCQs) which will test your skills in Casting, Forming and Welding I Concepts in a detailed and comprehensive manner. In the test, each question will have 4 options to choose from. You should select only 1 correct option as an answer and then move on to the next question. Once you submit answers to all the questions, you will be given your final test score. In the Online Casting, Forming and Welding I Test, for every correct answer, you will be given 2 points. There will also be negative marking of -1 for every wrong answer. So, you will have to be more careful in choosing the answers to the question in your online examination. If needed, you should skip to the next question and come back to the previous question later so that you can do proper time management for the online mock tests. 1. "Casting, Forming and Welding I Practice Tests" - In Casting, Forming and Welding I practice tests, there will be a series of practice tests wherein you can test your Casting, Forming and Welding I concepts on every chapter separately. There will not be any time limit on these tests. So, Casting, Forming and Welding I Practice Tests should be the first set of tests which you should attempt. Goto these practice tests here. 2. "Casting, Forming and Welding I Mock Tests" - In Casting, Forming and Welding I mock tests, there will be a series of mock tests wherein you can test your Casting, Forming and Welding I concepts on every chapter separately, but there will be a fixed time limit per test. So, it is similar to Casting, Forming and Welding I Practice Tests, but with an added constraint of time limits. You should try Casting, Forming and Welding I Mock Tests if you are appearing for any online examination soon. Goto these mock tests here. 3. "Casting, Forming and Welding I Certification Test" - Once you are through with your Casting, Forming and Welding I concepts, then you should try our Casting, Forming and Welding I Certification Test wherein Sanfoundry will issue a free Certificate to you if you scored either Grade A* or Grade A in Casting, Forming and Welding I Certification Test. Goto Casting, Forming and Welding I Certification test here. 4. "Casting, Forming and Welding I Internship Test" - If you are interested to do Internships in Casting, Forming and Welding I at Sanfoundry, then you must take our Casting, Forming and Welding I Internship Test. 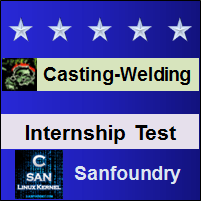 If you scored either Grade A* or Grade A in Casting, Forming and Welding I Internship Test, then you are eligible for Internship at Sanfoundry in Casting, Forming and Welding I. Goto Casting, Forming and Welding I Internship test here. 5. 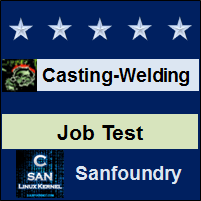 "Casting, Forming and Welding I Job Test" - If you are a fresher, a dropout, an experienced person and if you know Casting, Forming and Welding I well and looking out for jobs in Casting, Forming and Welding I domain at Sanfoundry (or our Network of Companies), then you should try and qualify our "Casting, Forming and Welding I Job Test". 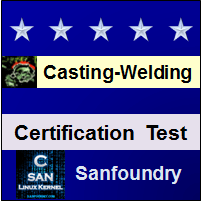 If you scored either Grade A* or Grade A in Casting, Forming and Welding I Job Test, then you are eligible for a Job at Sanfoundry (or our Network) in Casting, Forming and Welding I domain. Goto Casting, Forming and Welding I Job test here. For every "Casting, Forming and Welding I Practice Test", Total Questions: 20, Total Time: Unlimited. For every "Casting, Forming and Welding I Mock Test", Total Questions: 20, Total Time: 20 Minutes. For "Casting, Forming and Welding I Certification Test", Total Questions: 50, Total Time: 1 hour. For "Casting, Forming and Welding I Internship Test", Total Questions: 50, Total Time: 1 hour. For "Casting, Forming and Welding I Job Test", Total Questions: 50, Total Time: 1 hour. Before you get started on these series of online tests on Casting, Forming and Welding I, you should learn, study and practice our collection of 1000 MCQs (Multiple Choice Questions and Answers) on Casting, Forming and Welding I here. We also prefer that you should practice Casting, Forming and Welding I practice tests and mock tests completely before attempting the certification test. Here is the list of online practice tests and mock tests on Casting, Forming and Welding I. Each online test focuses on a "Specific chapter of Casting, Forming and Welding I". So, you should try both practice test and mock test on every chapter to do a self-assessment of your knowledge (along with time-limit constraints) in every area or sub-topic of Casting, Forming and Welding I. Casting, Forming and Welding I Certification test, Internship test, and Job Test are mentioned at the end of this list. 1. Casting, Forming and Welding I Test 1 – This set of online test on “Casting, Forming and Welding I” tests your skills on Difference between Pattern and Casting, Functions of a Pattern, Pattern Materials, Types of Pattern, Pattern Design, Pattern Making, Pattern Fillets, Finishing Patterns & Storing of Patterns, Pattern Colours, Jointing Materials. 2. Casting, Forming and Welding I Test 2 – This set of online test on “Casting, Forming and Welding I” tests your skills on Mold Materials, Molding Sands, Molding Sands Binders, Properties of Molding Sands, Refractory Sands, Grain Size and Shape, Bonding Theory, Fire Clays, Illite and Kaolinite, Molding Sand Mixtures for Casting, Indian Sand and core sand. 3. Casting, Forming and Welding I Test 3 – This set of online test on “Casting, Forming and Welding I” tests your skills on Preparation of Core Mix, Molding Sand Preparation, Testing of Molding Sand, Different Functions of Core, Making the Cores, Baking the Cores, Finishing of Cores, Types of Cores, Dielectric Core Bakers, Setting the Cores, Core Application. 4. Casting, Forming and Welding I Test 4 – This set of online test on “Casting, Forming and Welding I” tests your skills on Types of Molds, Molding Processes, Methods of Ramming Mold Boxes – 1, Methods of Ramming Mold Boxes – 2, Methods of Green Sand Molding, Hand Molding Equipment, Steps Involved In Making a Mold, Venting of Moulds, Forces Acting on Cores and Mold, Mold-Metal Reaction. 5. Casting, Forming and Welding I Test 5 – This set of online test on “Casting, Forming and Welding I” tests your skills on Green Sand Mould, Functions of Gating Systems, Gating Design, Functions of a Riser, Types of Risers, Riser Design – 1, Riser Design – 2, Directional Solidification, Aspiration Effect, Effects of Friction and Velocity Distribution. 6. Casting, Forming and Welding I Test 6 – This set of online test on “Casting, Forming and Welding I” tests your skills on Furnaces for Melting, Gases in Metals, Casting Cleaning, Product Design for Sand Castings, Special Casting Techniques, Shell Moulding, Precision Investment Casting, Permanent Mould Casting. 7. Casting, Forming and Welding I Test 7 – This set of online test on “Casting, Forming and Welding I” tests your skills on Die Casting, Gravity Die Casting, Vacuum Die Casting, Low Pressure Die Casting, Centrifugal Casting, Continuous Casting, Squeeze Casting, Slush Casting, CO2 Process, Inspection and Testing. 8. Casting, Forming and Welding I Test 8 – This set of online test on “Casting, Forming and Welding I” tests your skills on Inspection Procedures, Visual Inspection, Dimensional Inspection, Testing of Mechanical Properties, Destructive Testing, Non Destructive Testing, Mechanism of Solidification, Rate of Solidification, Solidification of a Large Casting in an Insulating Mould. 9. Casting, Forming and Welding I Test 9 – This set of online test on “Casting, Forming and Welding I” tests your skills on Solidification with Predominant Interface Resistance, Solidification with Constant Surface Temperature, Solidification with Predominant Resistance in Mould, Riser Placement, Residual Stress, Classification of Defects & Factors Affecting Salvage of Castings, Salvaging Techniques – 1, Salvaging Techniques – 2, Mechanization, Mechanized Foundry, Processing Steps in Mechanized Foundry. 10. Casting, Forming and Welding I Test 10 – This set of online test on “Casting, Forming and Welding I” tests your skills on Molding Machines, Core Making Machines, Foundry Environment Health and Safety – 1, Foundry Environment Health and Safety – 2, Dust Measurement and Sampling, Dust Control and Dust Extraction in Foundry, Dust Collecting Equipment, Elements of Preventive Maintenance, Pattern Allowances, Heating and Pouring, Hot Chamber and Cold Chamber Die Casting. 11. Casting, Forming and Welding I Certification Test - This set of online free certification test on "Casting, Forming and Welding I" tests your skills on all areas (all chapters, topics and subtopics) of Casting, Forming and Welding I. 12. 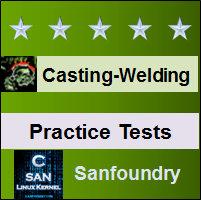 Casting, Forming and Welding I Internship Test - If you scored either Grade A* or Grade A in our Casting, Forming and Welding I Internship Test, then you can apply for Internship at Sanfoundry in Casting, Forming and Welding I. 13. 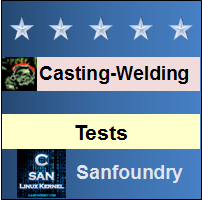 Casting, Forming and Welding I Job Test - If you scored either Grade A* or Grade A in our Casting, Forming and Welding I Job Test, then you can apply for Jobs at Sanfoundry in Casting, Forming and Welding I domain. 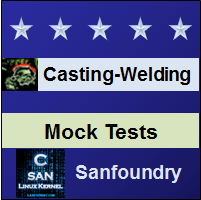 Best Wishes for your Casting, Forming and Welding I Tests!